It seems that director William Brent Bell is keen on asking for forgiveness for the sins of the past, namely his 2012 film The Devil Inside which infamously featured an ending so terribly anti-climactic that audiences reportedly booed the screen in protest, among its many other lack of qualities. Don’t worry: The Boy is a far better film by comparison, but when you start to put it next to some of the smarter and more ambitious horror movies out there, it comes off as a rather silly and relatively tame addition to the genre. To be fair, however, the premise is rather barmy to begin with – young American woman Greta (The Walking Dead’s Lauren Cohen) travels to England after escaping an abusive relationship, and takes up a job working as a nanny for a rich couple, only to find that the child she’s looking after is a porcelain doll named after their deceased son, Brahms. As you might expect, however, a series of strange events lead Greta to start wondering if Brahms is actually alive, and if she’s got a Chucky or Annabelle kind of situation on her hands. If you can’t get past the ridiculousness of the main plot, unless you happen to have a fear of creepy-looking dolls like the one they’ve featured here, it’s completely understandable. The further twists and turns it makes as the film goes on start to add up less and less, until it turns into a light farce by the climax which even begins to defy gravity as much as it does logic; the big reveal as it heads into its final set-piece is especially nonsensical, and you’ll be more concerned about how it’s all meant to work instead of what’s actually happening on-screen. Things don’t get as ridiculous as something like The Gallows or, indeed, The Devil Inside, but all things considered it’s a very silly set-up with an even sillier pay-off. As ridiculous as the film gets, it’s rather a shame that it takes itself all too seriously. A horror film with as silly a plot as this one probably needs to be a bit more tongue-in-cheek and self-aware, kind of like what the Scream franchise had done so successfully in its own little way; there are so many possibilities that could arise from that alone, like playing up the doll’s creepiness a bit more for laughs or the questionable behaviour of certain characters becoming more over-the-top as the film goes on like some kind of self-parody. But alas, it’s all played a little too straight, and any humour that does arise from it is purely unintentional, whether it’s one of the few lame jump-scares this movie has (which isn’t many, thank goodness) or, once again, the major reveal which simply doesn’t make much sense once you start to think about it. To Bell’s credit, however, he does allow for some nice gothic atmosphere to create the mood every once in a while, with the house itself drawing a few positive comparisons to Robert Wise’s The Haunting in terms of its design and overall isolated feel, while the cinematography is pleasant enough to establish the necessary mood without going too far overboard. The acting, too, is fairly solid, and Cohen plays a lead character that’s sympathetic and likable enough to get us through the more intense scenes this movie has to offer; she also shares a steady chemistry with local grocery boy Malcolm (Rupert Evans), who himself is a nice enough character you don’t want to necessarily see get in harm’s way. To say it’s a better-constructed movie than The Devil Inside is an understatement, even though The Boy does not offer a particularly strong script to begin with (again, the ridiculousness of it all can be hard to overlook at times). For a horror film, though, it’s not really that scary, and when it does try to scare you it’s more startling than it is truly terrifying; not once do you ever get that feeling of dread or anxiety that many of the better horror movies fill you with, and that makes The Boy perhaps one of the tamer films of its kind to come out for a good long while. It doesn’t even come close to some of the worse ones we’ve seen recently – it’s a better movie than The Forest, The Other Side of the Door, The Gallows and, we’re assuming, that stupid-looking Friend Request movie coming out next month – but if you want real chills and actual tingling sensations just from watching, you can honestly do much better. 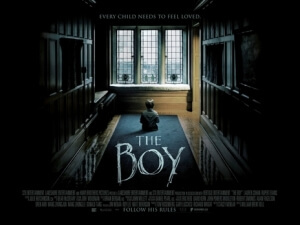 The Boy is an all-too-tame horror film that can’t seem to overcome its increasingly silly premise which gets more ridiculous and po-faced with every passing minute, and despite reasonable production values it fails to be anything more than just a little bit startling instead of outright terrifying.